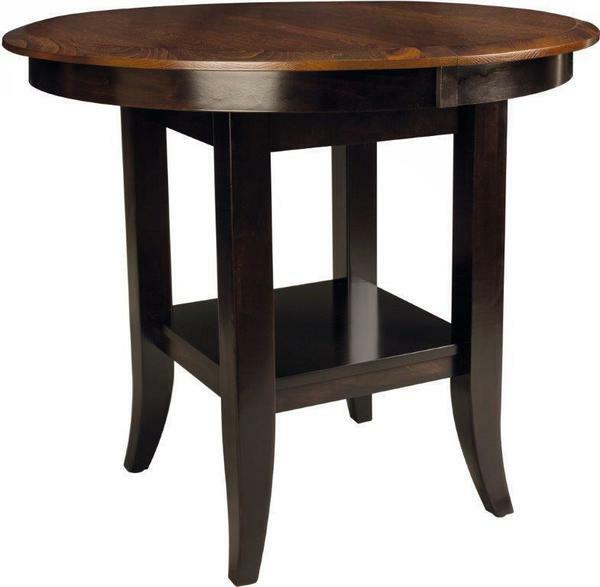 So many size options make this round extension table one of the most adaptable pieces DutchCrafters offers. Our Christy series, like all other Amish-made furniture on site, is handcrafted to the highest woodworking standards. The Amish craftsman responsible for your dining table will hand-select the hardwood of your choice and assemble the table by hand. Final touches include detailed sanding and wiping techniques for optimal protection and beauty. Choose from 3 round diameter sizes: 42", 48", and 54"
This table is shown in Grey Elm top with OCS-113 stain and Brown Maple base with OCS-230 stain, but it's yours for the customizing! Order a set of stain samples before placing your order, and call our Amish furniture specialists with any questions about Amish-made dining room furniture.